well I think that is what I was feeling as I ran home from work tonight. Today was my first run following my 10K on Sunday as it was the first day I did not feel like a 90 year granny everytime I stood up. Too high on making it to the finish line on Sunday and hurling abuse at Pirate boy for his trade description act text I forgot to stretch and my legs complained!! Unfortunately, i didn't get finish work until 6 so I headed out onto the streets of Edinburgh in the dark. My head torch was being very useful sitting in my kitchen!! My chest and legs moaned when I started off but by the time I was through the cowgate and heading to the park I started to feel quite good, dare I suggest I was enjoying myself! Holyrood park was pitch black apart from the passing cars so I was glad that I know that section quite well otherwise the runners high would have been squelched with a sore knee. By the time I was heading down Jock's lodge near my pad I was truly sampling the runners high I have heard so much about and I was flying down the hill. Tonight was only a short run to get the legs loosen up. On Friday I am meeting up with Ken at lunchtime to go for a short run and talk about a potential Fling relay team - OMG, OMG. Yes, not only do I sign up for marathons with only a couple of 5k's under my belt I am now trying to gather a relay team for a off road run of at least 12 miles in April. So far Ken is keen and Stan the man is up for it. I have emailed the fourth member but until she confirms I will keep her a secret or if she says no advertise the position on this blog and race forums. I blame this crazy, impulsive running ambitions on my Moon boots. My moon boots are my new and rather lovely Salomon Quest 4D GTX walking boots that I purchased from the very patient Tiso store in Edinburgh. They are the business. The moon boots were taken out last weekend when Mark and I joined our friends JP and Marieanne who rented a cottage in Glencoe for the week. Headed up on the Thursday afternoon with a quick stop at Bridge of Orchy so I could stomp around in the Moon boots then out for dinner to Loch Leven seafood cafe followed by drinkies at Clahaig with music by the Ghosties. Top day. On the Friday we headed to the Devil's staircase. 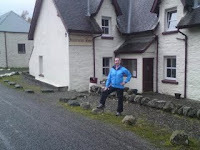 The rain was on but I was kitted out in paclite Berghaus waterproof jacket and trousers plus the Moon Boots. I was nervous. It was only 6 miles but it was the Devil's staircase. So we head on out and I am finding it okay, the Moon boots make me feel safe so I follow the pack and at times stopped to enjoy the view. After 30 minutes Mark and JP are waiting for Marieann and I to catch up when Mark tells me this is it. I ask what is it? we are at the top of the Devil's staircase. I do not believe him, and this goes to and forth for at least 5 minutes. I can't believe I got to the top without having to call medical support. Given the reports I have heard I had visions of having to crawl up the staircase however, by the time Easter comes along I will be carrying a pack, been on my feet for four days and 70 odd miles in my legs - I will not be thinking the Devil is so gentle then!!! Friday night was the boys heading to Clahaig to test the pints of beer to pool quality playing or something like that while Marieann and I shared a bottle of champers I got for my 30th and watched the Mamma Mia film. Cheesy but fun to watch. Dinner and drinks followed in the Clahaig. I love the Loch Leven Seafood Cafe. Went there last year for Marco's birthday. Well done on your great run in Strathaven. No I'm not the 4th member. I too have joined in with the madness and have agreed to do the Fling in another team. I will guess at a wee ringer getting brought in here. Toni McIntosh? Paula Radcliffe? Freya Murray? Sharon? Debbie? Bet you'd never think that last one would be in the same line as the others!! top one the Princess... Keep at it, the high's just become higher !